The “Theology” of Aristotle remained unknown to the Latin Middle Ages; however, Arab scholarship was then renowned as a channel for reaching Aristotle’s unknown writings. So, it comes as no surprise that, when in 1519 the “Theology” was translated from Arabic into Latin, Aristotle’s authorship was not challenged. This is the incipit of the Latin version of the “Theology” of Aristotle which is appended to the 1593 edition of the Nova de universis philosophia by Francesco Patrizi da Cherso (1529-1597). As shown by this title, Patrizi had a suspicion that the Theology was not by Aristotle; his final explanation was that Aristotle had written down in the Theology the mystical doctrines he had heard in his youth, when he attended Plato’s unwritten lectures. As wrong as this explanation might be, it reflects Patrizi's awareness of the fact that the Theology gives a distinct non-Aristotelian ring. Towards the end of the 19th century, the German Orientalist Friederich Dieterici (1821-1903) published the Arabic text of the Theology from an Arabic manuscript housed in Berlin. The Neoplatonic nature of this text became immediately clear to him. Once the Theology was translated into German, the specialist of the “Aristoteles pseudepigraphus” Valentin Rose (1829-1916) had an easy time to account for its real nature: what had circulated in the Arabic-speaking world under the label of a Theology by “Aristotle” was nothing if not Plotinus’ Enneads, excerpted and arranged in a new order. Hence, the testimony of the Plotinus Arabus was taken into account by the editors of the Enneads. One of the undisputable achievements of the 20th century in the field of Greek philology is the edition of the Enneads by Paul Henry (1906-1984) and Hans-Rudolf Schwyzer (1908-1993). Among the pieces of evidence of the indirect tradition of the Enneads, Henry and Schwyzer took into account also the Arabic version: thanks to the cooperation of Geoffrey Lewis (1920-2008), they were able to include in the edition of Plotinus’ Greek text also an English translation of the Theology, as well as of other Arabic texts stemming from Plotinus. Being face to face with the Greek, the English translation of the Arabic Plotinus follows the order of the Greek original, which is by no means that of the Arabic version. Shortly after the edition of the Enneads accompanied by the Arabic Plotinus, the Egyptian scholar ʽA. Badawī (1917-2002) published a new edition of the Arabic "Plotiniana", based on more manuscripts than those available to Dieterici, but lacking in critical method and accuracy. The decisive step in the understanding of the nature and origins of the Arabic translation of Plotinus was made by Gerhard Endress’ path-breaking Proclus Arabus (1973), a study of the Arabic version of Proclus’ Elements of Theology. A leader of this project, Endress discovered that the Arabic Proclus shared the same linguistic features and doctrinal adaptations as the Arabic Plotinus; the syntax and style of the translation, as well as its terminology, featured also in other Graeco-Arabic texts (mostly Aristotelian) stemming from a circle of early translators whom al-Kindī attracted. The scientist and philosopher al-Kindī (d. around 866 C.E.) 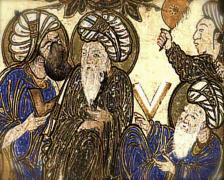 is acknowledged both in the ancient sources and by contemporary scholarship as the initiator of Arabic philosophy. The ERC project Ideas, Advanced Grant 249431 will produce the critical edition of the pseudo-Theology of Aristotle. The edition will be accompanied by a translation, a running commentary, and bilingual indexes (Greek-Arabic and Arabic-Greek). As against the two extant editions, whose basis was limited to the manuscripts available more or less by chance to the editors, this edition will be grounded on the analysis of the entire manuscript tradition, and will be conducted according to the standard philological procedure of recensio and eliminatio codicum, constitution of the stemma codicum and establishment of the critical text and apparatus. Unlike the extant English translation that, being appended to the edition of the Greek Enneads, follows the order of the Greek original instead of that of the Arabic version, the critical edition will obviously keep with the structure of the pseudo-Theology of Aristotle, which is very different from the Greek original. In this way, the text will be made available under the form in which it used to be read by Medieval Arab philosophers like al-Fārābī and Avicenna. A running commentary will clarify the adaptations that Plotinus’ thought and wording underwent in the process of translation. The critical edition and commentary of the Theology will be the work of a team of specialists in Greek and Arabic studies.